A total amount of more than Rs 150 Crores has been allotted for Entrepreneurship related development activities. Government proposes to launch Comprehensive Mission on Employment Generation (MEGA) to provide holistic direction and oversight to self employment programmes. The scheme is provisioned to constitute state specific Credit Guarantee fund, Seed Fund, Angel fund and Incubation Infrastructure Challenge Fund. An amount of Rs. 25 crore is provided for this mission. An Incubation Infrastructure Development Fund will be constituted to meet gap financing needed for infrastructure development for facilitating for incubators and host institutions. Rs. 10 Crore set aside as initial investment. Rs. 11 crore to provide Rs. 1 crore each to set up Incubation Support Centers in the Universities in the State. Performance Linked Support Scheme for Startups – support 1000 startups with performance incentive of Rs 10,000 per startup per month for the first two years. Rs. 12 Crore set aside for this. Rs. 40 crore for the Entrepreneurship Support Scheme to provide extensive support to micro, small and medium enterprises. Rs. 50 Crore for self-employment initiatives for youth, women, SC/ST beneficiaries, fishermen etc. Educational assistance of up to Rs. 3 lakh per year, for any student entrepreneur able to secure a patent, for continuing his or her postgraduate studies or research for a period of three years. Rs. 5 Crore allotted for this. Raising the financial limit of loan offered to technocrats from Rs. 10 to Rs. 15 lakh and for others from Rs.4 lakh to Rs. 7 lakh, under the Kerala State Entrepreneurship Development Scheme. For any industrial units run by women employing not less than 50% of women in its work force, the new Interest Subvention Scheme for Woman Entrepreneurs, will bear the entire interest for loans availed from any scheduled bank up to a maximum of Rs.5 lakh per annum for three years. Rs. 10 Crore set aside for this. Yes, it’s good to see Crores being rolled out for promotion and innovation of entrepreneurship. But is the entrepreneurship bandwagon on the right path in the state now? I have shared my views in detail about that in another post. Going through this budget, I can’t help but be reminded of how I answered my University Exams during engineering – how I would use the same concept in answering 3-4 questions by just twisting the presentation method. Maybe it’s my ignorance and lack of knowledge about the “technical terms”, but there seems to be a lot of jargon above. Jargon which gives me a feel that it’s just another way to throw dust in the eyes of the public. Point 1, 2 and 3 all talk about Incubation Infrastructure Fund. Then why segregate it in the first place? Point 4 literally bums me up. Incentives for the startups seems like rather a dirty joke! Almost as if you are on your way to make salaried entrepreneurs. I’ll tell you what will happen, to a good extent, if this clause is introduced, without proper implementation. Adding to the already diluted community of quality entrepreneurs, students with backpapers will get into entrepreneurship for namesake. They’ll utilise these 2 years living off the “salary” from the government, and after 2 years when they have cleared their backpapers, they’ll be off to either the US or the Gulf to pursue a career. This will not only throw the Govt. Funds into waste waters, but further degrade the trust in the startup community of the state. Point 6 – It’s the 21st century for heavens sake. Stop allocating anything and everything to SC/ST Quota. Give it to the deserving. I still do hope that the so-called-Crores are actually given to the deserving. But seeing how the policy makers and the people responsible for implementation for the same are handling the concern, am not at my confidence best. When goons and goondas are given responsibility of allocating the budget and people with vested interest are made responsible for implementation of the same, you might get the results in quantity by hook-or-crook, but never in quality. And that’s exactly what’s eating up the entrepreneurship community in this state. A sweet smelling vanilla tasting cyanide. Disclaimer : This post is written with a bias of having seen enough of crap promises being made to the entrepreneurial community with hardly any real beneficiary action being seen in places where they are meant to. 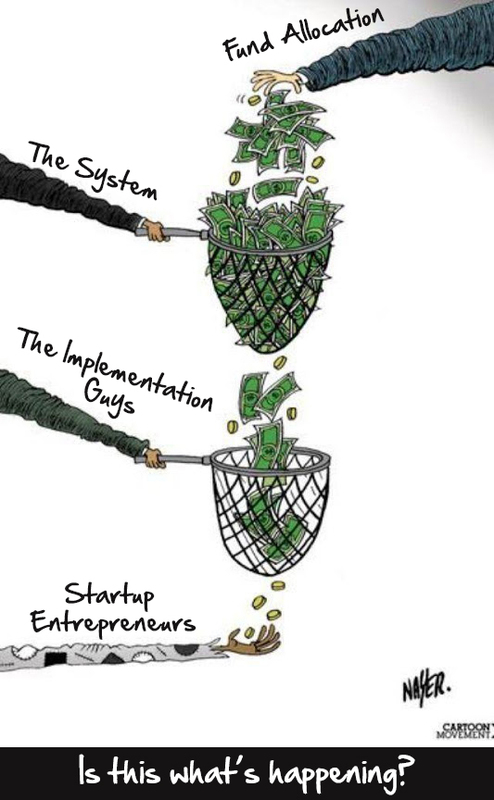 It is indeed a stupid move to introduce incentives for startups!